The Gemini Augers & Screw Pile product lines are vast, diverse, and can be custom tailored to any of your earth moving needs! Our flight construction is undertaken with either cold pressing / forging or hot pressing / forging the flights. Gemini Auger flights manufacturing capacity ranges from: 4” OD to 70” OD, Pitch sizes from: 4” to 24”, and Thickness from: ¼” to 1 ¾”. We can custom manufacture flights from virtually any alloy. Our flight cutting edges can be manufactured to any of your specific industrial needs including: hard surfacing cutting edges, tapering cutting edges, carbide tip inserts or weld inlay onto your cutting edges, jagged / teeth construction onto the cutting edges. The Gemini Auger & Screw Pile shaft and shaft connections can be manufactured to any API thread or Kelly Box sizes. 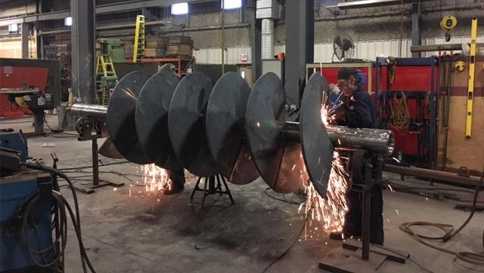 The Gemini Augers & Screw Piles are manufactured to the highest industry standards considering our ISO certified processes along with our certified CWB welding processes.